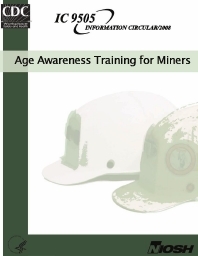 From the first day of new miner training until the day they retire, mine workers will experience changes due to the normal aging process. It is an unfortunate fact of life that many age-related changes result in diminished physical, sensory, or cognitive capabilities. Of course, workers also gain a tremendous wealth of experience, knowledge, and insight as they age, making them a vitally important resource for their company. Effective leveraging of this precious resource requires both an appreciation of the changes that occur with age and an understanding of methods that can be used to reduce the injury risk that may result. The purpose of this training is to provide the information necessary to accomplish these objectives. Aging workers may not necessarily have a higher injury risk overall; however, the effects of a musculoskeletal injury (MSI) on older workers may be more extreme. 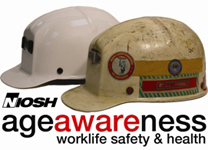 MSHA data show that not only does the percentage of MSIs increase when workers are over age 30, so does the number of days lost per injury [MSHA 2005]. Protecting the safety and health of aging workers requires matching the demands of the job to worker capabilities. This means reducing or eliminating risk factors for injuries, such as heavy lifting, awkward postures, static postures, repetitive movements, and/or vibration exposures. In other cases, it may mean improving visibility or streamlining processes. Designing jobs to accommodate the changing capabilities of older workers will not only reduce injury risk for older workers, it will have the added benefit of protecting younger employees as well. Download and extract the ZIP file to a folder on your hard disk. Start by opening the file called "index.html" in the root directory. If this fails to run you can still access all the necessary files using Windows Explorer. Just view the documents folder, which contains all the files in the various formats: Microsoft Word (.doc), PowerPoint (.ppt), Rich Text (.rtf), and PDF (.pdf).